On the 1st February 2016 the Canberra Metro consortium was chosen to deliver the first stage of the Capital Metro light rail project. The Canberra Metro consortium, formed by Pacific Partnerships, John Holland, Mitsubishi Corporation, Aberdeen Infrastructure Investments, CPB Contractors, Deutsche Bahn International, CAF and the Bank of Tokyo – Mitsubishi UFJ, Ltd., will design, construct, maintain and operate the project for 20 years. Canberra Metro is part of an ongoing transformation towards sustainable renewal and growth, and is a key part of Canberra’s transport, social and economic Infrastructure. Canberra Metro will change lives and lifestyles, stimulating social and economic participation, increasing modal share of public transport use and preparing Canberra for the future. Architectus and dsb Landscape Architects have provided urban design, architecture and landscape design services for Canberra Metro. The winning urban and landscape design is uniquely Canberra, with a sense of place which reflects the attractiveness and liveability of the bush capital. Canberra Metro is urban design with a light touch, where the unique native landscape and garden city character of Canberra takes centre stage. The Canberra Metro landscape design extends and develops the Griffin landscape boulevard for Northbourne Avenue, in keeping with the aspirations of the City and the Nation. An overarching canopy of native trees with an understorey of native plants and grasses, establishes an iconic landscape and gateway to Canberra and the national capital. We have designed the Capital Metro Project for Canberra, delivering civic dignity and pride and a quality of public space equal to Canberra’s most important public and cultural projects. For example, the Australian War Memorial is a key reference for understated and timeless design, offering inspiration for Canberra Metro’s urban and landscape design and the use of bronze and warm natural tones, durable materials which weather attractively, and sustainable native landscape design. In addition, the urban design, architecture and landscape design specifically addresses the challenges of Canberra’s variable climate. The design incorporates local customer feedback with improved weather protection from wind-driven rain, and enhanced solar access for winter sun. Canberra Metro’s design incorporates an understanding of Canberra’s pedestrian and cyclist requirements with special focus upon safe and easily accessible walk-up spaces, and safe movement onto light rail vehicles. The design provides a seamless interface between light rail vehicle and platform, and offers an easy to use and understand customer experience for Canberrans of all ages and abilities, and for passengers travelling with bikes. 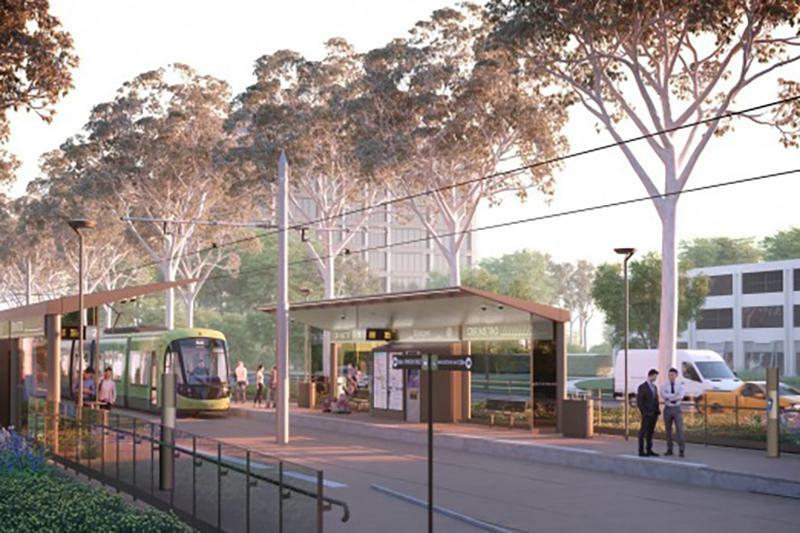 Architectus and dsb Landscape Architects look forward to working collaboratively with the project team and the people of Canberra in the design and delivery of Capital Metro.